Harvard Alumni for Education (HAEd) celebrated this year’s National Arts in Education Week (September 10-16) with a meetup during the university-wide event, Question + Create: A Harvard Alumni Gathering on the Arts. Sponsored and hosted by Harvard Alumni Association, Question + Create brought together alumni from across the university to celebrate their contributions to the arts and to connect members of the Harvard community interested in and working in and through the arts. Question + Create took place on September 15-16 in various locations on campus and was quite a showcase of the university’s involvement and footprint in the arts. 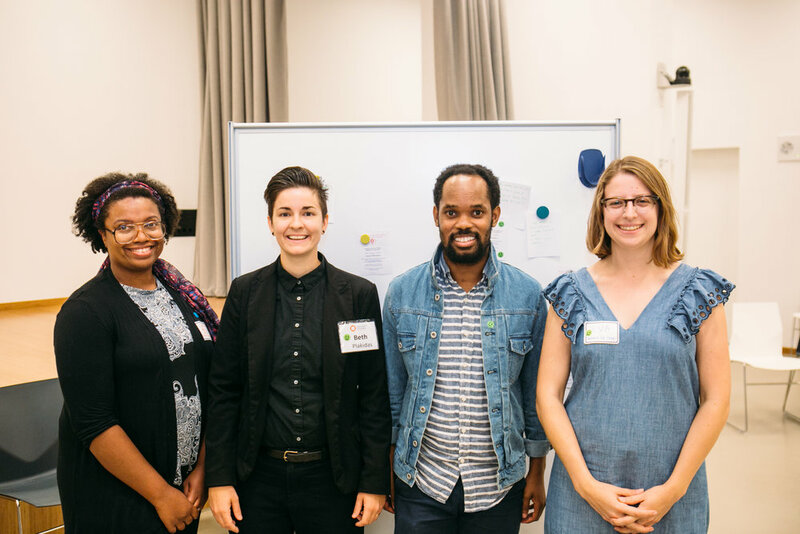 On Friday, September 15, Harvard Alumni for Education partnered with Harvard Ed Portal, a collaborative partnership involving Harvard, the Allston-Brighton community, and the City of Boston, to host a meetup of arts advocates, practitioners, and educators. The meetup served as an opportunity for Harvard alumni to connect and reflect on the transformative power of arts education; it included a personal tour of Harvard Ed Portal and conversation with the portal’s Arts Program Manager Eva Rosenberg '10 about its placement and impact in the community. Harvard Ed Portal opened its doors in February 2015 and has since fostered innovative methods of learning and sharing knowledge across the intersections of visual and performing arts, science and technology, wellness and recreation, economic, workforce and professional development for varying ages and learners. Au Bon Pain and Trevor Hall of RebelHouse Group generously sponsored light fare and beverages, respectively, for the meetup. HAEd Executive team members Michael Sanders, Ed.M. '14, and Lakita Edwards, Ed.M. '02, organized the event. Both Michael and Lakita are graduates of the Arts in Education Program--which recently celebrated its 20th anniversary. See sights from Harvard Alumni for Education's National Arts in Education Week Meetup below, and visit here for a full university-wide recap of Question + Create. True to arts ed, we questioned some alum & asked them to create on the spot! Written by Michael Sanders and Lakita Edwards.